Have you ever been feeling overly tired, drained or fearful and anxious for no reason? Have you ever felt that your thoughts and emotions don't really belong to you? Ever experienced a heaviness in your chest that almost suffocates you? 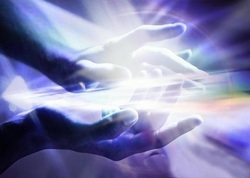 If you have, you may have entities and implants attached to your auric field. Entities are non-human energy forms that can attach to you for different reasons and hold the vibration of a certain individual emotion, thought or can be the product of collective emotions or thoughts. They are extremely varied, in some cases, they can be demons. Implants or cords belong to living humans are energy strings that link you to a certain person. Most of the time, these strings are a form of energetic vampirism and are a result of manipulation, dependence and control. These cords and entities, once identified, can be transmuted into the Light just like any other form of energy. If you have any suspicion that you carry one or more of these around you, a simple radiesthesia diagnostic and psychic scan will tell you if that is the case and a cleansing session will be held, bringing in high energies of Light. The cost of such a session is 50 pounds for implants and human spirits and 100 pounds for demonic entities.